You live in one specific city. You know a limited number of people out of the world’s approximately seven billion. You only have a numbered amount of days to do a numbered amount of activities. You’re small. 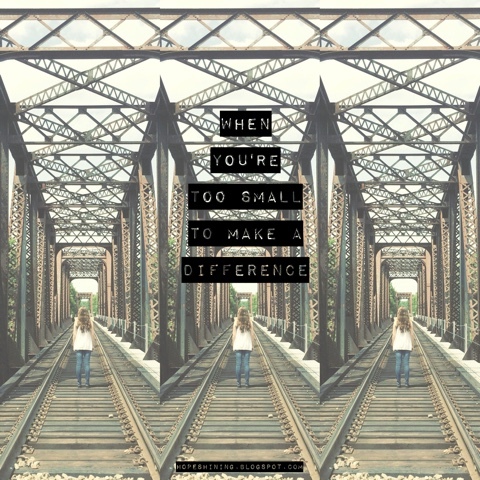 I’m small, and this can be daunting, sometimes, as we wonder if our one small life can make a difference. Should we even try to make a difference? ​1. ​ The Big God of the universe loves you and calls you. This is the epitome of difference making, and we find commands of other hard, difference making actions in the Word. We, as Christians, are called to be difference makers. We’re called to model our life after Christ’s (1 Cor. 11:1), and He made the ultimate difference for us; He died on the Christ so that we might have eternal life (Jn. 3:16). Turn from our selfishness, pick up our cross, and follow the King of Kings (Luke 9:23). Love one another, even to the point of laying our lives down for our friends (Jn. 15:12-13). We are called to be difference makers. Why then do we so often not make a difference? ​2. ​You are capable of big things through Christ. We often don’t step out and make a difference because we are holding on to something: discouragement. We need to hold on to hope that we can make a difference, for we can do all things through Christ (Phil. 4:13). 3. You're part of a big family. As we are committed to the call, some days will still bring glaring reminders of our smallness. Yes, we’re small, but our God is big; He’s put us in a global family of brothers and sisters in Christ. Together, our small existence adds up to a bigger whole. Our “small” actions of difference making add up to a world that is collectively being impacted. You’ve been put in this place and time on purpose (Acts 17:26). Hold onto the hope in Christ and lose yourself in faithful obedience to His call. Together, as family, we are impacting the world. This post was originally seen on Fervr.